Love the Life you Live: THIRTY!!! Today is the day that both Marc and I were born. I can't remember for sure, but we looked it up once, and it seems like I was born around 1:30pm and Marc was born around 3:50pm. Yes, I married a younger man. That two hours and twenty minutes is huge! We are celebrating the BIG 3-0 this year! How awesome is that?! I'm totally thrilled about the thirties. Seeing as life just keeps getting better and better, I just know really great things lie ahead and I can't wait. So, anyway, I just wanted to take a moment to spotlight My Sweet One. To be honest, I don't think I understood exactly what I was in for when I agreed to marry him. I mean, I knew it would be good... I just didn't realize how AWESOME life would be with him. Seriously, I have it so good. Let me start off by saying that over the last month I have thrown up more times than the rest of my life put together. And, when I'm not throwing up, I'm curled up on the couch trying to keep myself from throwing up. As a result, my help around the house with daily things has been greatly limited. Marc has done SO MUCH to help keep us alive. On top of his already busy schedule of work and bishopric duties, he's been doing the grocery shopping, the cooking (or sometimes "warming in the microwave"), the dish-washing, the back-rubbing... and, most wonderful of all? He's been covering my 6am early morning seminary class for me. He has been so wonderful in every way. I am so blessed!! And, then on top of all of that, the cutest thing happened the other evening. I was in my usual curled position on the couch when the doorbell rang. Marc was in his office working. He answered the door to find three young kids, asking for donations for Little League. Two girls and a younger boy. So, he grabbed the only cash we had on hand and gave it to them. They left and he went back to his office. Well, a few minutes later I hear him rushing out the front screen door. Thirty seconds later he comes in and in the most concerned voice says, "where are the bandaids and neosporin?" I was confused and asked what happened. Well, turns out that all the way from back in his office he could hear someone crying, so he went out to see what was going on. The Little League boy had apparently stabbed himself with a pen and according to Marc, "no one was even helping him." It was SO sweet, as I watched Marc bandage up this little boy. He must have done it just right, because in perfect little boy fashion, the tears immediately stopped the moment the bandaid was in place. I can't wait to watch him naturally assume the role of father. He is going to be so great! And, I can't talk about Marc without mentioning how HILARIOUS he is. He can be sitting in a room with people aging from 14 to 84 and say something that has everyone laughing. Now, that's talent. He just has a great sense of humor and can turn any tense situation around until people are laughing. It used to frustrate me when I needed to have a good heated discussion about some important topic, and I never could under his charm and wit. I love that about him. Life is never dull with him! There is so much that I love about him. Like the fact that he is totally fine with the half of a "Mother's Day" carrot cake someone brought over for us yesterday counting as our birthday cake this year. And, that since I don't dare eat out in public right now we'll probably be eating crackers and ginger ale for our special birthday meal. 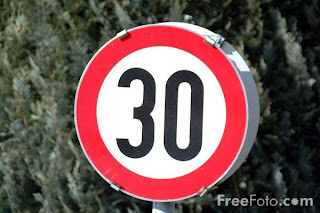 BUT, I promise that in a couple of weeks (when the vomiting has hopefully stopped) we will have a REAL celebration of our big 30th birthday! I love you, Marc! Happy Birthday! I'd sing, but it wouldn't be pretty. Happy birthday to the birthday twins. Oh look - the birthday twins - are having twins!! Cuteness! Happy Birthday you two! I would have left this on the "all in a month" post, but I thought you might not see it. I haven't been keeping up with your blog the last few weeks since it hadn't been updated and I just checked today. I started having my suspicions when you kept saying how you were throwing up all the time. That is really freak'n awesom! I started reading your blog sometime last year and decided to keep reading it until you got a baby (not that I"ll stop now). I've told my husband that if I knew anyone that wanted to give their baby up for adoption that I would recommend you even though I don't know you...I even said if I was a teen mom or something I would totally give you my baby. But that is just amazing that you turned up pregnant and with twins! Congratulations and good luck with all of the sleepless nights to come. :) It looked like they were in the same sac...are they identical or can you not tell at this point? Happy Birthdays! I have to agree, Marc is hi-larious. So few words, but all of them great. We love you too Megan! Happy Birthday (Late)! How fun to have been born on the very same day! I hope you didnt feel too sick and were able to enjoy your day together! Happy, happy birthday, Megan and Marc Dears! Happy days will come to you all year! If I had a wish then it would be . . . a whole lot of carrot birthday cake for ME! Ha! Seriously, I hope you start feeling better. Just push those fluids. Seriously. I ended up in the hospital needing IV's because I got so dehydrated on my first baby from the puking. So, to avoid that unpleasantness, try some different kinds of Gatorade and talk to the doctor about some options to help. There is a drug used to treat nausea in chemo patients that is WONDERFUL. It helped me survive. Love you! Hi, I just found your blog from a comment you left on my sister-in-law's blog, kieraanne. I'm so happy for you even though I don't know you at all ;-) I'm a birth mom that placed over 15 years and I continue to volunteer with LDS Family Services. Good luck with the morning sickness...I'm sure you more then anyone can appreciate that it will be all worth it! !